There were no significant variants, different marks of ordnance were minor internal modifications. The carriage marks reflected increasing using of welded instead of riveted assemblies. During the course of the war PL Locks and AC Slide Boxes were replaced by PK Locks and Y Slide Boxes, this modification normally occurred at the same time as modifying the axial vent for a 0.303-inch tube instead of a 0.5-inch one. 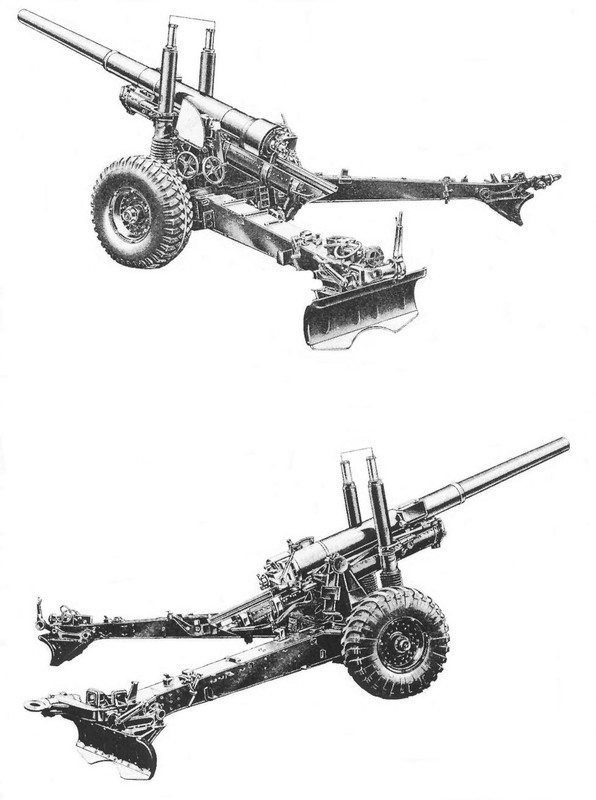 Later production ordnance were fitted with these new components. 1. A dial sight adaptor and digging either a trail pit or wheel mounds enabled upper register fire to a maximum elevation of about 70�. 26/Manuals/2625 HE, Mk 1D, 100 lbs 6/12 CRH,1940. 26/Manuals/3125 Chemical, BE, Mk 1D to 4B (5 projectiles wts 90 - 98 lbs), 1943. 26/Manuals/3271 HE, Mk 1D, 100 lbs 6/12 CRH, 1943. 26/Manuals/3342 HE, "80-lb", Mk 1D, Charge Super, 1944. 26/Manuals/3446 HE, "80-lb", Mk 1D, 1944. 26/Manuals/3498 Coloured Smoke, Coloured Flare, "100-lb", 1945. 26/Manuals/3521 HE, "80-lb", Mk 2D & 3D, Upper Register, 1945. 26/Manuals/3684 HE, "80-lb", Mks 1D & 2D, 1948. WO Code 14544 HE, 1966. Ordnance, BL, 5.5-inch, Mk 3 on Carriage, 5.5-in Mk 1, (Provisional), 1941. WO Code 11077 Ordnance, BL, 5.5-in Mks 3 & 4 on Carriage 5.5-inch & 4.5-inch Mks 1/1 & 2/1, 1956.